This multivolume work is a compilation of five half-yearly volumes of the British satirical magazine Punch, or the London Charivari, which was in print from 1841 to 1992. It is one of very few periodicals from the nineteenth century to reissue stereotype copies of itself for public consumption. From the elaborate and highly decorative index to the durable and elegant binding, it is clear that buyers collected and saved these reissues. Punch, based in London, began on July 17, 1841 with weekly publications. It had 12 pages of double columned text, wood-engraved cartoons, a variety of comic illustrations interspersed within the writing, and a range of visual embellishments that included decorative capital letters and tiny silhouettes. The square page and double column organization mixed text, illustrations, humor, and criticism effectively. Within the pages of these volumes are varied forms of satire, which contain criticisms of everything from legislation to railroads, and comedy concerned with the trials and aspirations of the emergent middle class. 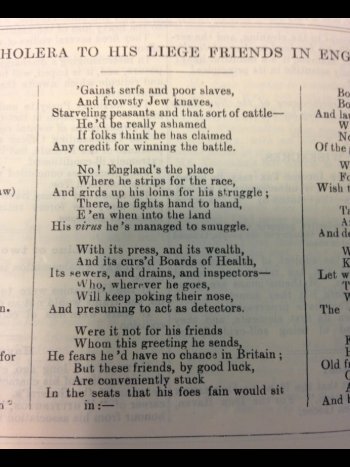 Famous in its early years for unbridled and radical criticism of social ills, Punch became more moderate in its later history, but continued to comment on social and political matters. 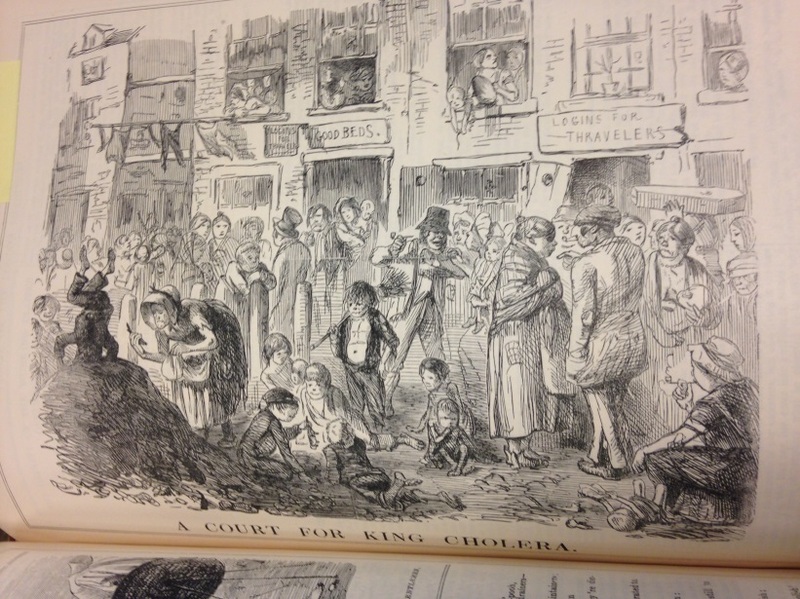 For example, Punch printed a satirical illustration showing the poverty and destitution of the lower class areas of London, dubbing it “A Court for King Cholera.” Through this picture, Punch asserted that cholera ran rampant through London due to a lack of government action on public health problems. Punch’s success lay in the fact that it was not overly offensive, but remained satirical. As a “threepenny comic paper,” it was cheaper and more entertaining than newspapers. 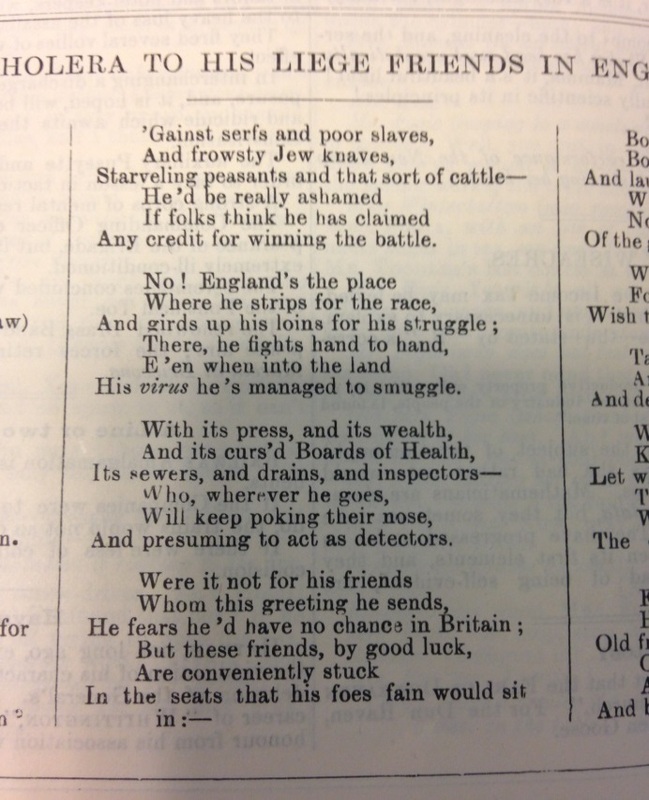 Punch’s poetry required an audience decently educated in the English language. Its satire needed a consumer well informed on current events, and its cartoons necessitated a clever and discerning eye. With columns brimming with an assortment of puns, epigrams, and witty comments on everything from public health to crime and punishment, Punch became very popular with the middle class. However, this newspaper continues to be important, as it offers a window into the past. 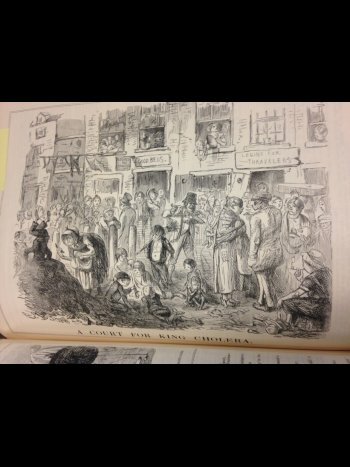 Thus, Punch’s greatest achievement comes from its ability to capture everyday life in Victorian England, including what people looked like, their style of speech, and how they conducted themselves in public and in private.